Whether you are soundproofing a party wall, ceiling or floor the construction of the walls of your property is a key factor as to whether that soundproofing will be effective. Flanking transmission can act to undermine the best soundproofing projects. So What is Flanking transmission. Flanking transmission is simply the term used to describe the passage of sound through other structres indeprendent of the structure you are trying to soundproofAirborne sound will enter any solid structure, and will have a tendency to move in that structure. Where the structure is brick this movement is relatively limited, and not really a problem. This however is NOT the case in breeze block structures. Within breeze block sound has a tendency to move much greater distances, and will move easily into any other structure which is also breeze block. Other build types may also suffer this problem, we tend to find it more prevalent in more modern construction types post 1950 which employ light weight building materials. 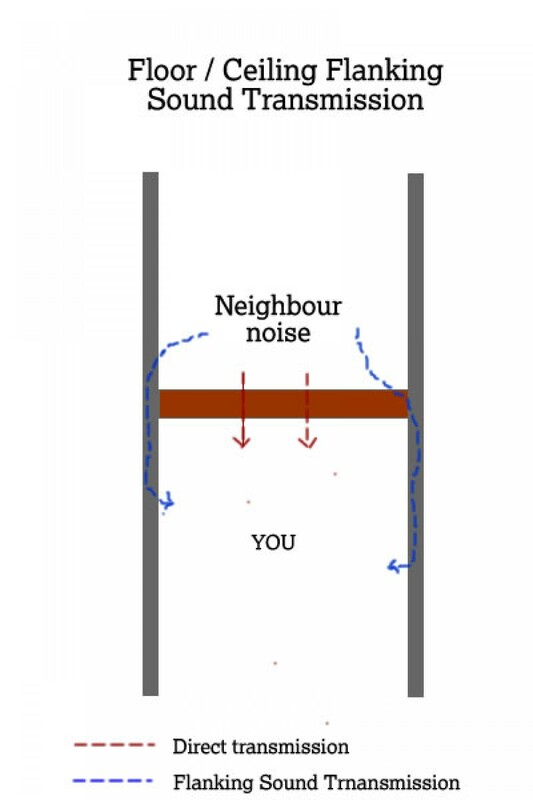 So for example you are living in a 60’s built property and you have noise issues with your neighbour. Typically the walls of this kind of property will be made up of breeze block internally, not just on the party wall. The sound therefore will very likely be coming out of the party wall but also it will be emitting from any other breeze block wall attached to this wall. Such that soundproofing the problem wall is unlikely to remove the problem as the sound will in effect be coming in around the sides. A way of testing whether this is the case is to put your ear to the party wall, then to other four walls in the room. If it is loud in these other four walls as loud it is unlikely that you will achieve successful soundproofing. Soundproofing all the walls is not usually viable due to the presence of doors and windows. BE AWARE that not all breeze block performs so badly. But where it does no soundproofing system from any manufacturer will be effective if applied just to the party wall. Equally the flanking sound problem can be experienced in other lighter weight construction types. The same problem can occur through ceiling and floor where the walls are light weight construction. The floor or ceiling can be soundproofed but the residual sound just carries down the wall leaving your efforts possibly wasted. Steel and concrete RSJ's can also act as effective conduits for the sound to travel through.